My mother kept written journals off and on for most of her adult life. At first, they were straightforward records of day-to-day happenings, holidays, and milestones. Later, she kept a journal she called The Joy Book, with entries about things for which she was grateful. Last year, after decades of suffering from debilitating rheumatoid arthritis, my mother moved to a nursing home. Weighing a mere 70 pounds and with joints so deformed that she could no longer walk or hold a pen well enough to write, she surprised me one day by asking for a journal. Her plan was to keep it on her dresser so that visitors could sign it or leave a note about their visit. My sister bought her a hardbound Italian-made Fabriano Venezia Art Book with heavy weight creamy paper and paired it with a plastic Bic four-color pen. With these incongruous materials, the final journal began. The entries are mostly brief and primarily from my six siblings and me, my mother’s sisters, and a few dear friends. Day after day, week after week, the entries are almost entirely mundane– a stroll outside, the status of her comfort, notes on the weather, things brought or taken, and references to lots of chocolate milkshakes. Occasionally, I’d take a minute to add a touch of artwork to enliven the pages. My mother died this week at the age of 81. And as I read the pages of this nearly full book, I see that we wrote for her what she could not write herself. We wrote her final journal. It is a painful reflection on how terribly diminished and boring her days were, but likewise, it is a powerful reflection on caring, compassion, simple joys and pleasures, and the love and support of family…the very things that mattered most to her. There are lessons here: about gratitude and determination, about the things we leave behind, and about saying what needs to be said long before final words are spoken or written. I’m grateful to have all that captured here, and a lot more, to carry forward. This entry was posted in Journal and tagged dying, keeping a journal, resilience by Jean Mackay / Drawn In. Bookmark the permalink. So sorry for your loss Jean. Thank you for sharing such a poignant end of life story. End of life is an important part of life. It helps all of us to share some of the ways we can participate in the journey. Indeed, Bri! We are, indeed, better and wiser for walking those final miles with our loved ones. Thank you Cinda. I’m sure your children and grandchildren will be very grateful for your journals one day, and I hope the same can be said for mine. These bound books…so ordinary, so extraordinary. Let’s keep painting! Automatic spelling….if I could remember to read before send…. I’m glad you have this wonderful last journal – it must have brought your mother great comfort. To be honest, my mother never knew what we wrote in this book. But perhaps she trusted that it would become more than just a “visitor log” for us. I also have her Joy Book, which will be a gift to read in the days ahead. Thank you Alexandra. I appreciate your taking the time to write and share your support. What a wonderful treasure you have, thanks so much for sharing this, and all your other artwork / journals. So meaningful to so many. Sincere sympathy to you. Hi Mary- I felt like I was going out on a limb with this post, so I’m glad to hear your and others’ appreciation, and to connect with the deep experience of love and loss that we all share. What a moving and lovely thing this journal became. I’m all teary now. You are a special friend and a loving daughter and sibling. My mom died when I was 8, no records, no trace of how many people were involved in her life or illness. Thank you, Jean. Hi Nina- Thank you for checking in. How different for you to grow up without your mother; absence replacing the presence in defining a relationship. It is good that we find many people to hold dear in life. It leads to the pain of loss for sure, but also irreplaceable richness and joy. This was really beautiful! I am teary-eyed reading this. The journal is lovely and kept with your mother’s tradition of journaling. I’m sad to hear of her passing. Your colorful drawings added life to the pages! I’m sure her heart felt really big because of this! I will light a candle for her in church. Thinking of you and your mother. Thank you so much– I appreciate you extending your sympathy and seeing the beauty in these ordinary pages. I’m sorry for your loss. I’m sure this beautiful journal had given her great comfort in her final journey. The mundane things are actually a wonderful reminder of her life. Thanks Kai– yes, I think our task is always seeing the wonder and finding joy in the simple, even mundane, moments and stuff of life. Whoa Jean. An incredibly beautiful tribute to your mom. Yes, she was one remarkable woman; even as she diminished in size, her heart, grace and steadfast determination continued to grow. She loved you fiercely and I know you loved her the same. You helped make her life worth living Jean, even through all of her suffering. Adding your stunning artwork to her journal was a gift. One of so many you have given to your Mom throughout your life. I will be here throughput this next journey Jean. Sending you all my love now. You are the best, Darienne. Thank you for your great capacity for love, kindness, joy, and gratitude. I’m glad you’ll be with me for the long haul. Very sorry for your loss, Jean. I’m sure your mom was a special woman, so beloved. Thank you for sharing her journal with us. I appreciate your kind support, Monica. I am so pleased to start my morning with this beautiful tribute to your mother, her network of family and friends and to the amazing joy a visual record can give us. Beauty lives! Sarah- My mother would absolutely agree. Even in her darkest moments, she looked for goodness and gratitude. Here’s to the potential and power of keeping a visual journal! May she rest in joy! Sorry to hear of your loss – what lovely memories you will have in that journal. Yes Margaret. We are grateful to have those memories and to have shared that time with my mom. I am so sorry for your loss. What a beautiful gift she gave to you all by asking for a journal for others to fill. Thank you for sharing this part of the journey through her last journal. Thanks for reaching out in support, Cheryl. I’m so sorry for your loss, Jean. Thank you for sharing the journal that your very wise mother had you all start. What a wonderful gift and remembrance! Yes, Debra…she was wise and also very good at getting us to do what she wanted! There is much grief in her death, but also much gratitude for the life she lived and example she set. Jean, sharing your personal thoughts and memories of your mother and her daily habits is very touching and it must be difficult for you during your grieving. I love the fact that your mother felt it important to record her thoughts in a journal; It must have been healing for her considering the daily pain she experienced. I’m so sorry for your loss. What a gift she left in this record. God be with you. Thinking of you and your family.. Thank you Cary. Ben and Jonah arrive home tomorrow– I’ll pass on your good wishes. Hope to see you soon. I am so sorry for your loss. What a beautiful tribute you all shared with those things that seem boring but are indeed something that are part of your mom’s joy in her life. Bless you all. Thanks Shelley. My mom managed to find the good in everyone and everything. I am much blessed by her life and example. You have moved me to tears, how wonderful to have the journal full of memories. My mum was similarly disabled and painted for as long as she was able till she left us 25 years ago, I still miss her. Hugs to you and your family. Valerie- I’m glad my post touched that place in you where your love and memories live. May we both walk on in grace. So sorry to hear of your dear Mother’s passing. What a treasure to have her final journal, I wish I had something similar from my mother, we lost her 2 years ago, to dementia. Yes. I’m very grateful to have it and extremely grateful that my mother was able to connect with us and make decisions right to the end. I’m sorry you had to go through the slow pain of loss of your mother to dementia. What a wonderful tribute to your moms spirit and grit. My mother will be 88 next month. Her world is much the same as your mother’s was. May this journal bring you peace. Thank you Tori. Spirit and grit are good words to describe my mother. It’s not easy to see our parents decline so much. I wish you good moments with your mom in the coming months/years. So very sorry for your loss. Your post was beautiful! Thank you Roxanne. I appreciate your note. Thank you for sharing this lovely journal with all its memories. Losing a mother is hard at any age. I still think of mine when I laugh at things I know she would enjoy too. Your paintings make the journal a thing of beauty. It was always a little precarious to paint while visiting, but I’m glad I was able to illustrate a few pages. I’ll miss my mother, as you do yours, in all sorts of small moments that would make her smile. Dear Jean — thank you for sharing this amazing ‘last journal.’ My mom died last December, and, like yours, was greatly diminished at the end. It is an awful end to a rich and full life. Though heartbreaking to witness, you did justice to bearing that witness in a unique way that I think will help you deal with her death. It is never easy, but as you point out, you also have the validation of love and support from those who loved and cared for your mother. Know that I am thinking of you and hope that your art will help you bear the pain. So sorry to hear of your mother’s passing and of her physical challenges that made simple things difficult. So glad she had you for a daughter and Dan for a son-in-law, may she Rest In Peace. Lorraine and Bob- Thank you so much for your kind note. My mother loved having a big family and a big extended family and I am so grateful for the support of this large clan. I think it is safe to say that she is resting in peace, and I’m glad she was able to keep smiling to the end. My heartfelt condolences, Jean. It is so difficult to lose one’s mother. One feels it in such a deep, primal and resonate way. The journey, so poignantly shared in the final journal, is an amazing testament to your mother and your family. There is such beauty, love and grace in this final chapter. Thank you for sharing it. What a brilliant idea your mom had. You all have a journal that not only ties your family closer together but is an indelible reminder of what a great mom she was until the very end, thinking only of her family. This will be a wonderful memory book for her grands and great-grands and might instigate others in the family to do the same. My mother in law passed some years ago and she had a visitor’s book for years that you had to sign or you couldn’t get out the door. No accompanying drawings though, sadly. She was the glue that held the whole family together as everyone was spread out across the country. A happy, sad, historical journal that family will be picking up and reading and reminiscing throughout their lifetimes. It is difficult these days to keep family together; a journal like this would certainly do the trick! Thanks for sharing. Thanks Carole. Journals are inherently personal and typically private, so it is unique to have this collaborate journal. Imagine if we had started it long before she reached the nursing home. It is hard to keep big families together when the matriarch passes on. But that is our challenge and I’m ready to take it up. So very sorry for your loss Jean. What a superb inspirational idea your mum had in having all her visitors write in her journal and your art work adds lovely splashes of colour to the pages…. Thank you Evelyn. I appreciate your kind words. I’m so sorry about the death of your beloved mother, jean. What a beautiful remembrance the journal is. Much healing love to you in your time of loss. Jean, I am so sorry for your loss of your Mother. What a beautiful story about her last Journal. Hi Bonnie- So glad you reached out. I appreciate your support. Thanks Tonya- I’m glad you found comfort in your loss, as I trust I will too. I am sorry for your loss. The journal was a beautiful idea and a wonderful way to capture memories. I lost my mother to Alzheimer’s after an eight year struggle. I understand how difficult it is you Watch a loved one decline. Your mother sounds like an amazing woman an her Joy Journals will be a comfort to you in the years to come. I am sorry for your loss. Her journals are a wonderful legacy for you. Thanks for reaching out– appreciate it! Thank you for posting this – I know it’s not easy, yet putting it out here helps, I hope. I just retired from working with elders and their families & partners. Most had dementia or other life-limiting illnesses, some were in nursing homes, some at home, some in other situations, and some of whom I journeyed with to the end. There are many profound lessons to be savored when you accompany someone close to you to the end. The journal was quite a gift, not really “from” or “to” any of you, but touching everyone – including the aides and nurses, I bet. Take care, and remember everyone grieves differently, so allow yourself plenty of space, if you can. Thank you for sharing your experience– what a thoughtful note. My mother was a nurse who cared for the most needy her whole life. Becoming the one who needed care was not easy for her. It is, indeed, a privilege to share in life’s final journey, but it is not for the faint of heart. You are right that there are many profound lessons to be learned. I’m sure you gave a great deal to the families of those you served…I so appreciated the care of the aides and nurses who enabled me to be a daughter more than a caregiver. You’re so right, it’s not for the faint of heart! I bet your mother’s discomfort with being the dependent one created a few difficulties. But I have to come back to the journal, such a profound gift, even in – especially in – its ordinary telling of those last days. So sorry to hear of your loss. Your words are beautiful Jean. Clearly inspiration from the beautiful person your mother was. Thanks Donna! She was a beautiful lady! Family to keep. Thank you for sharing. There is much to treasure from my mother’s life — I’m blessed with much goodness and grace. My condolences to you and your family about the loss of your mom. I am thinking of you and wishing happy thoughts. The idea of the journal is a beautiful one. I am glad you have it. 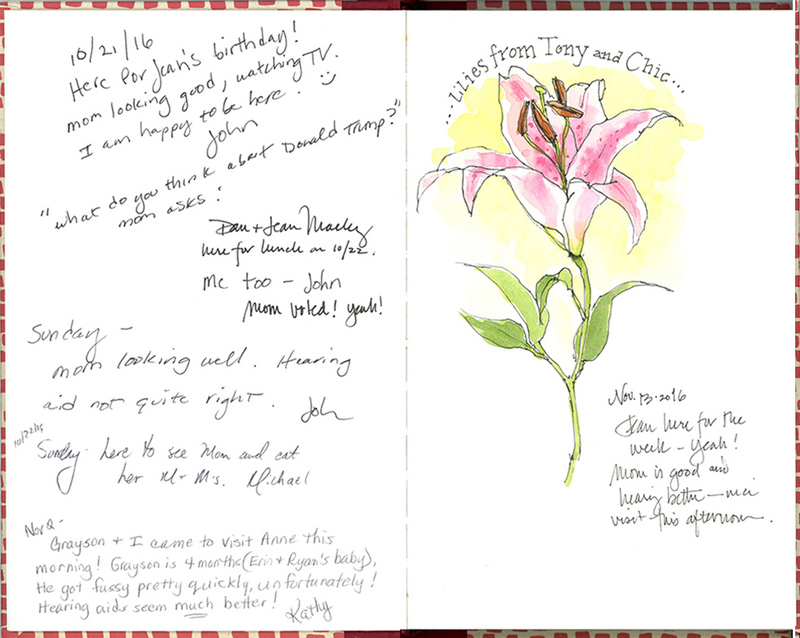 What a beautiful memory of those final weeks of your mother’s life, made all the more beautiful by your drawings, Jean. I lost my father on a September 27, too, in 2005. What brought comfort to me after his passing, was feeling him so strongly in me — be it my gait, my nose, my thought processes and so much more. I hope you feel your mother in you, as well, and that this brings you joy and comfort in the years ahead. Sincere condolences for your loss. I’m so sorry for your loss! I am deeply touched by this post… and the keeping of the journal for your mother. You and your mother will be in my thoughts and prayers. Peace be with you. Thank you — that is very thoughtful of you. I am grateful for the support of family and friends– near and far. The peace to you Jean, what a beautiful tribute to your mom. So sorry for your loss – thank you for sharing such an intimate and beautiful journal. It really touched me deeply bringing back memories of my mom and mother-in-law – both of whom I lost in the past couple of years . Thanks again and wish you wonderful memories to sustain your loss .